As I struggled to process this latest in a long line of musical deaths in 2016 my mind jumped to Bill Callahan’s weirdly brilliant homage, Prince Alone in the Studio (recorded under the Smog name in 1995). Callahan managed to nail what was so distinctive about Prince: his dedication and perfectionism. Callahan imagined the artist working on his sound as the night drifted into the early hours of the morning, ignoring everyone and everything (including his need to eat) except for the guitar track he was trying to perfect. When he finally had it how he wanted he felt, in Callahan’s words: “like a hunter on the street”. If Prince’s dedication to his art was legendary, so were his productivity and range of stylistic languages. Whether writing, performing, producing, acting, or lending his skills as a sideman to others projects, there were times when Prince seemed to be everywhere and everyone. For me this multiplicity is bound up with three distinct but connected aspects of voice: the voice of the writer, that of the singer and that of the instrumentalist. As a writer he was legendary, composing songs in a bewildering range of styles and genres for himself and for countless other artists. As a singer, he was always distinctive, whether growling low, purring in his middle register or swooping up to exhilarating falsetto heights. As an instrumentalist he was too often overlooked, yet his guitar playing has spawned many a spirited (if ultimately pointless) online debate about his merits in relation to other virtuosos such as Jimi Hendrix and Eric Clapton. A brilliant example of this interconnected voice can be found in a clip that was widely shared in the wake of the news of his death. It is a live performance of Purple Rain, the song which has been a mainstay of Prince’s concerts since its release as a single in 1984. The writing, as with the best of Prince’s work, has an elegant simplicity, alternating brief, evocative verses with the gospel-like refrain of the title and Prince’s distinctive electric guitar. The song is further simplified in this live version through the use of just one verse, followed by the chorus and an extended instrumental section. Prince applies a range of vocal styles to this performance, often in quick succession. The first time he sings the chorus line, his voice drifts upwards, using melisma to break the word “rain” into fluttering fragments. On the repetition of the line, the voice moves downward to a smoother, mellower register, while the third iteration sinks to a deep, Elvis-like shudder. For the pay-off line, Prince swoops back to falsetto for the word “see”, slightly elongating the word for effect and thus changing the rhythmic shape of the chorus’s resolution as originally sung. Then there is the guitar, underlining and extending every emotional nuance of the song, leaping between the singer’s lines, tearing away but always returning, always simultaneously in and out of control. 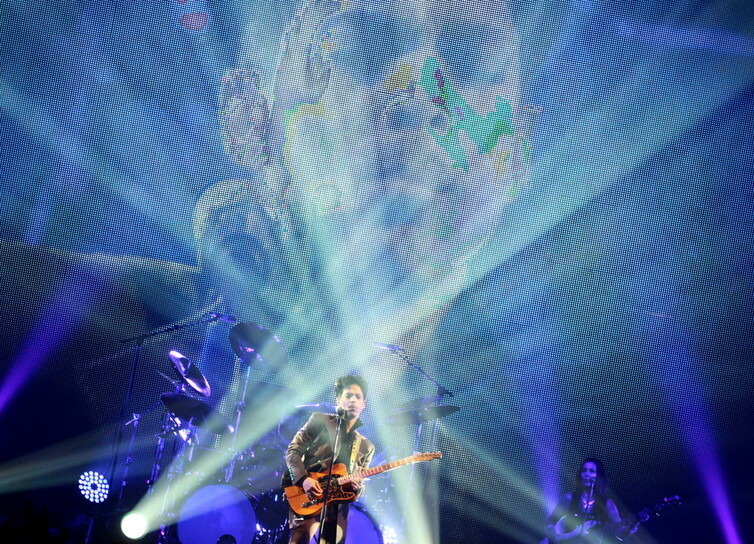 Prince starts to solo immediately after delivering the chorus, his guitar becoming the voice of the song and making any further verses unnecessary. As in much gospel music, this playing seems to signal transcendence of the word, as though the voice cannot complete its work alone and must be extended through other voices or, as here, the prosthetic extension of the guitar’s ecstatic screech. But Prince is not done with singing just yet. As he reigns in the flash and danger of his guitar he returns to the microphone to deliver one of the song’s most catchy elements, the wordless vocal melody that, in other concerts, the artist would encourage his audience to sing instead of him. At this point, Prince is essentially yodelling, fixing on to that strange, affective vocal realm associated with Swiss mountaineers and American singing cowboys. It’s another example of the inadequacy of the word, of how “voice” dispenses with verbal reason when it needs to signal emotion. It’s also music of the most sublime kind, drawing on sacred and secular registers in a seemingly epic but really all-too-brief sample of what Prince was capable of. This is only one of thousands of masterful performances that have already been shared amongst Prince’s fans and that will be returned to in the days and months to come, to offer solace, counter incredulity at this latest loss, and pay witness to a truly eclectic and classical artist. For this is what Prince was: not in the narrow sense of his interest in Western classical music, but in a far more liberated and liberating understanding and extension of the varied streams of a black classical music tradition that incorporated gospel, jazz, R&B, rock and roll, soul, funk, hip hop and more. Prince was a funky preacher in command of a sophisticated and party-ready congregation. In the wake of his passing, Minnesota radio station The Current dedicated itself to a programme of “wall-to-wall Prince”. Listening in there was a sense that the party would never end, that it could and would continue without its progenitor.